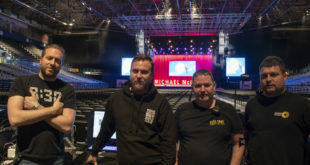 Turbosound has been a mainstay of British sound reinforcement and loudspeaker development since it was founded in the 1970s, delivering a solid catalogue of products and working with many of the top international touring acts. The iNSPIRE series aims to address the demand for compact, portable and versatile loudspeaker systems for small to medium-sized venues and the latest additions to the range are the 800W iP500 and the 1,000W iP1000 and iP2000. Recently I was given the opportunity to put a pair of iP1000’s through their paces. 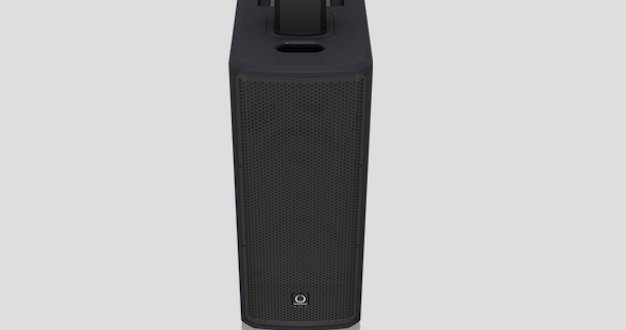 The iP1000 is a powered modular column loudspeaker that comes in two pieces: a bass unit and a thin column, which is mounted on top of it. The base unit houses the amplifiers, controls and 2 x 8in woofers, the column comprises 8 x 2.75in mid range drivers and 1 x 1in tweeter. Four spikes in the base of the column ensure you connect it the right way round and prevent it from toppling over once connected, while an electrical connector slides home to provide signal to the speakers in the column. This is a neat solution, which obviates the need for speaker stands and connecting cables. The columns are made from aluminium and the sub from plywood – covered in a hardwearing semi matt black paint finish – which should be able to handle being thrown into the boot of a car on a regular basis. When assembled it stands just shy of two metres; the columns alone are 1.3 metres long so if you plan on transporting them in a Mini you may need to come up with a creative solution. The mid-range drivers are located in the upper half of the column with the tweeter positioned at the top; this ensures that even if they’re floor-mounted the sound should still carry over the heads of a standing audience. Some people think of column loudspeakers as the original line arrays and while they do share some properties they don’t really behave in the same way, neither do they behave like point source systems – they sit somewhere in between. The bottom end of the system behaves very much like an omnidirectional source, radiating sound equally in all directions, whereas the mid range behaves much more like a line source, radiating forward with a very wide horizontal dispersion, and the top end is a point-source horn. This gives a nominal horizontal dispersion of 120º, which Turbosound suggests make them ideal for use without monitors as the musicians can hear what they need from the iP1000 (as long as they are intelligently placed, of course). Therefore it’s very much aimed at self-engineering musicians as well as bands, but can also be utilised by DJs and for speech reinforcement. The iP1000 benefits from Turbosound’s fraternal association with Klark Teknik and thus uses its Class D amplifier technology to deliver up to 122dB max SPL, which is controlled by Spatial Sound Technology. It also utilises Bluetooth to enable audio streaming and facilitate remote control. There are two XLR/jack combo inputs on the back, which can cope with microphone or instrument inputs, as well as two XLR link outputs (to enable chaining of multiple units). Once it’s powered up it can be operated via the control panel, which features an LCD screen, four buttons (Process, System, Exit and Enter) and a dial (which doubles up as a button) – when not in the menus the dial controls the master output level of the system. Navigation is very simple – there are two main menus (Process and System) with four sub menus, each of which has a single parameter page so you can quickly get to what you need without endless scrolling or getting lost in multiple sub menus. Basic operation is very straightforward and intuitive. The System menu gives access to Bluetooth pairing, a separate control for the subwoofer level, the Info screen (which shows model and firmware information) and the Setup menu – this allows you to adjust the LCD screen contrast and toggle its backlight as well as do a factory reset or lock the unit with a PIN (to prevent unwelcome tampering). The Process menu is where you’ll find the digital mixer and master EQ, as well as the Mode and Positioning menus. 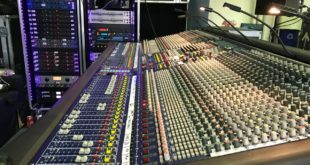 The mixer allows simple level control of the three inputs (i.e. the two analogue inputs and the Bluetooth stream) while the EQ gives you the ability to boost or cut the bass, middle or treble globally (i.e. it affects all channels). 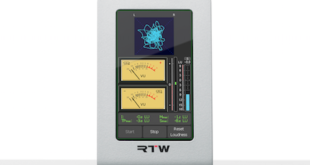 There are four modes available: Music, Live, Speech and Club, each of which applies a different EQ to the output. Music mode is flat, Live gives a slight bass and treble roll off, Speech has a lot of bass and treble roll off and Club boosts the bass and treble. The positioning menu is where that Klark Teknik Spatial Sound Technology comes into play with three options: Floor, Wall and Corner. Floor sounds flat, Wall has a little bass roll off and Corner has a bit more bass rolled off. This makes perfect sense as bass frequencies are essentially omnidirectional so when you place a speaker near a wall the bass frequencies going out the back will reflect forward increasing the overall level and when you place it in a corner both walls reflect to increase the level even more out front. One obvious omission I spotted is the lack of phantom power. I understand why this was left out as most users of this system won’t require it but it might catch out those who are hoping to use the latest hand held condenser microphones or an active DI (although some models of microphone and DI allow the use of batteries). The first test I did was to play music through a pair of iP1000’s using an iPad. The Bluetooth pairing was straightforward, as was the speaker linking (as long as you do it in the right order). The overall sound was crisp and clear, the directionality was as expected, the bottom end was firm but not overpowering and the mid range was slightly dominant. I tried the four different modes and found that I preferred listening to music in the Club mode as the smile curve it applies helped tame that slightly dominant mid range. My next test was with a singer-songwriter (i.e. voice and acoustic guitar), which I imagine is probably going to be a common configuration used with this system. First I selected the Live mode and then I plugged in an SM58 microphone. When I set the input channel level to 20dB I was able to crank up the main system output to 0dB without any feedback, regardless of whether I was in front or behind the speaker; I had to crank the input level to 30dB before it started to howl and that was a low frequency (about 80Hz), which was easily dealt with by reducing the bass by 10dB in the system EQ. I then tried the guitar and was able to get a decent level relative to the voice without further intervention; the sound of the guitar was a little muddy but that was quickly dealt with by tweaking the EQ on the instrument itself. I found that if I got the musicians to sit between the speakers they could hear enough of the mix to be able to play along and this worked fine for all three performers. The only issue I had was with an acoustic guitar that had a basic pick-up with no EQ settings – in the absence of any channel EQ I just had to live with the boomy and dull sound. I then fired up the remote control app. It’s worth noting that iOS is the only platform supported so you will need an iPhone or iPad if you want to take advantage of this functionality. I was pleased to discover that the app was even easier to use than the on-board controls. The main controls are presented in a simple interface with big chunky knobs for the level controls and simple sliders for the EQ. The app gives access to all the available functions and removes the need to go to the unit itself to adjust anything which makes it brilliant if you’re self engineering. 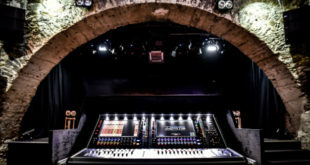 Overall I think Turbosound has done a great job of striking the balance between providing enough features to enable trouble-free sound reinforcement while not overwhelming the user with a feature set that requires a complex interface to operate. Personally I would have liked individual channel EQ and access to the graphic EQ on the output but then when I remind myself it’s not really aimed at me I realise they’ve pitched it perfectly.